The most devastating type of winter storms to affect north-west Europe are characterised by a descending jet of air, known as a sting jet, that can result in strong, localised surface winds and wind gusts in a region of the storm not normally associated with strong surface winds. The Great Storm, that ravaged southeast England 30 years ago on 16 October 1987, is a prominent example of this type of storm and the first published case in which a sting jet was identified. Since then, sting jets have been formally identified in several other storms and the term ‘sting jet’ has become common in the media, as shown by the recent coverage of the revolution in weather forecasting triggered by the Great Storm by the BBC and The Guardian. Last year, a team of researchers from the Department of Meteorology published a study about the frequency of sting-jet windstorms between 1979 and 2012 (Hart et al. 2017). They found that about 32% of cyclonic storms over the North Atlantic between September and May have the potential of generating sting jets. Applying the same techniques as in Hart et al. (2017), we have gone one step further and have produced the first study on how sting-jet windstorms might be different in a warmer climate (Martínez-Alvarado et al. 2018). Our study assumes the most extreme scenario of climate change considered by the Intergovernmental Panel on Climate Change (IPCC), in which greenhouse gases continue to rise throughout the 21st century. 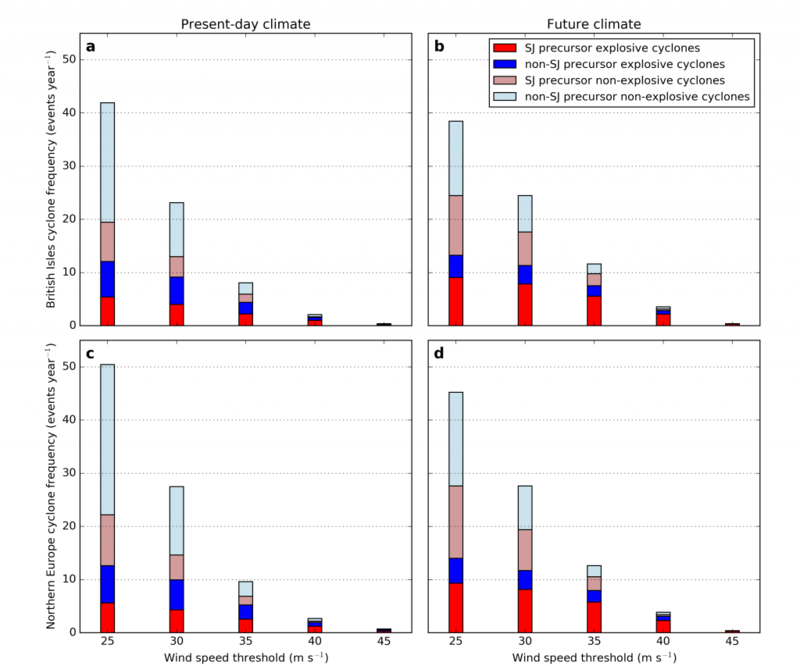 Our results show that the proportion of cyclonic storms with the potential to generate sting jets increases to around 45% in the warmer climate. Furthermore, while the proportion of explosively-developing storms (low pressure systems whose central pressure falls very rapidly) is similar in the two climate simulations, the proportion of these storms with the potential to generate sting jets increases from 9% to 14% in the warmer climate (Figure 1). In a previous blog entry, Giuseppe Zappa discussed the changes that cyclonic storms might undergo under climate change. Among these changes he mentioned an increase in cyclones associated with extreme rainfall, related to a larger amount of moisture in the atmosphere. We think that this larger atmospheric moisture content is the reason behind the increase in the frequency of storms capable to generate sting jets. However, more work is needed to confirm this. Figure 1: Infographic illustrating the number per winter season and percentage of all identified cyclones categorised by type of development (explosive or non-explosive) and potential to generate sting jets. A mixed symbol is used to represent the dominant types of cyclones where the rounded percentages do not add to 100% (Martínez-Alvarado et al. 2018). We also looked at the wind risk posed by these storms for the UK and northern Europe. We found that the risk of wind speeds larger than 35 m/s over both regions increases, and that a large proportion of that increase is due to explosively-developing sting-jet storms (Figure 2). One factor to consider when looking at these results is that the models we used tend to underestimate wind speed. Therefore, this wind risk is likely to be larger in the real world. Figure 2: Events per year of strong resolved-wind events in storms with (red shading) and without (blue shading) the potential to produce sting jets (Martínez-Alvarado et al. 2018). This entry was posted in Climate, Climate change, Climate modelling, Environmental hazards, extratropical cyclones, Weather and tagged sting jet. Bookmark the permalink.